Announcement: The winner of the fat quarter bundle and magazine over here is Amy DeCesare and the winner over on my instagram account is crazyquiltlena. Congratulations, ladies! Send me your snail mail addresses and I'll get them out to you. Thanks to everyone for the helpful comments - you've given me so many ideas! It is Quiltmaker's 100 Blocks time again and today is my day blog about my block and have a giveaway! I wanted to do a simple-to-sew appliqué block so I chose one of the trees I drew for this line and enlarged it quite a bit, then added borders and corners so that it would create a diamond pattern when joined with its neighbors. So... onto the giveaway. 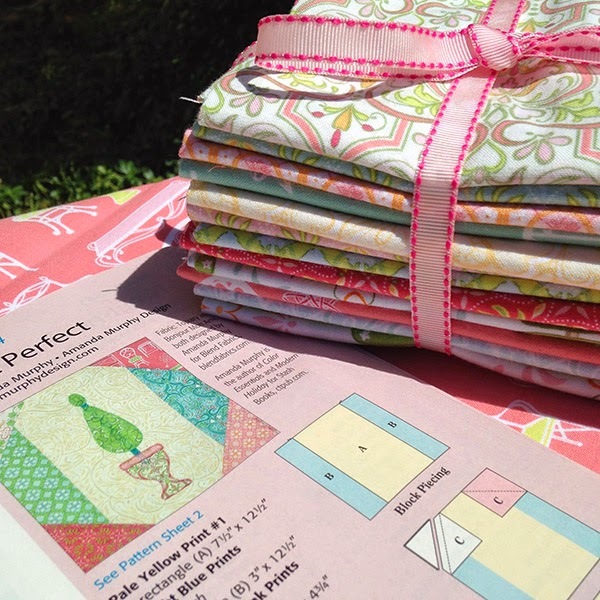 Quiltmaker is giving a copy of the magazine to one of you and I'm throwing in a fat quarter bundle of Topiary! To enter, leave me a comment letting me know what colors you'd most like to see in a quilt collection for a boy. (I know this is off-topic considering the style of the fabric in this block... but I'm curious.) And I'll also be picking an additional winner from my instagram followers so if you don't follow me there already please consider it. (My user name over there is amandamurphydesign.) The deadline to enter is this Friday, May 2nd, at midnight. The fabric looks beautiful in the block, love it. For a little boy, I am thinking faded denim type shades. Lovely fabric and design of the block! I would choose a blue/green color scheme for a boy. Cute block for this collection, Amanda. I like a mixture of primary colors for a boy. I really like the block you designed. I am not too great at applique, but I might give this one a try. I have a wonderful veggie garden, but no topiary. For a boy would use what my boy loved for colors: orange and purple. (He is now at the age where his "colors" are black, navy, grey and tan which I point out to him are not actually "colors"). I love all things topiaries including your fabric line! When I choose fabrics for a boy I like to include gray, blue, and muted orange. beautiful! I'd love to see more orange in boys' collections. I love blue-green mix for boy. Thank you for giveaway. Great block! I would like to see a line of green fabrics designed for boys. I would choose primary colors but I am old and I believe babies like primary colors and Black, Whie and Red. However the current generation likes Teal, a green to match and a sort of mustard yellow and even grey. Not my choice but I have made a lot of quilts in these colors. Right now I'm thinking of blue and orange for a boy's quilt, for my nephew. Great block, and gorgeous fabric! For a little boy quilt, I think navy and lime would be fun. I always find boys so difficult when it comes to colours. But just lately I've started liking green, orange and taupe together. Thanks for the giveaway. Love the block & especially the fabric line. For a boys quilt I really like the colour combo of Navy Blue, Silver grey & teal. I like the color light blue and brown together for a boy. Love your fabric, thanks! Fabric line is fantastic. For a boy I would like to see Aqua/Teal or Green Shades. Thanks for having a give away. Love your block! I would like grey, red and blue. I would love to see blues, greens and browns in a boy quilt. I love the block that you made. Great topic since I am expecting my first grandson in September. I like all the blue tones but some purple and yellows in the mix would be nice. My nephew loves anything orange, so I think an orange and blue scheme would please him. Congratulations on your block making the cut! Lately I'm loving navy with bright colors. A collection for boys combining navy with bright greens and oranges would be fun. I like medium blue (or royal) along with Chocolate brown with some green and reds thrown in to accent it. Even a rich purple could be used instead of the red in a boys line as long as the color is rich and saturated. Yummy, yummy fabric! Thanks so much for the opportunity to win! I like the typical "boy" colors, but like to use I Spy fabrics for interest. I think green/blue/purple would be a good combination for a boy's quilt, with maybe some brown. Thanks for sharing your cute block & thanks for the chance to win. That's a great block! Colors for a boy...when my son was little, he seemed to favor Southwest colors (and we live in New England!) - turquoise, orange, deep yellows, salmony reds, deep tans, rust- earthy colors ... they actually worked great in doing his room. Great block! I just thought of several embroidery designs to use it with. And your fabric is lovely! I'd like to see navy, green and orange for a boys line. I think a red and black color scheme for a boy, like firetrucks, would be fun to do. I like greens for boys....I think blues get over-used. I love topiary bushes....the work that goes into getting them into the different shapes is just daunting to me. But I am glad that there are others that can do it. I always think of primary colors when choosing for a baby quilt--eye candy, I guess! I like bright primary colors for a boy quilt. I think they like them too, or black. That seems to be the most popular crayon color in school! Amanda, I love topiaries and your new fabric line. Thanks for designing this block. I would like red and blue for boys fabric. Your fabric line is stunning! I love the sophistication of a topiary tree along with all your gorgeous color choices. It makes me wishing I was on vacation in England right now. I actually have to make a baby quilt and I'm looking for a few shades of blue including turquoise along with, greens, browns, oranges, and yellows. Thanks for the wonderful chance to win an awesome fat quarter bundle. Beautiful! For a boy quilt I would go with blues and greens...although I like the idea of Woolen Sails with faded denim! I love the block! For a little boy, I like to use bright, primary colors. Your block is beautiful and I love the Topiary line! For a boy, I would envision bright blues, greens, reds, yellows. Thanks for sharing! Very cute block. I like bright blue and green for boys' quilts. I like shades of browns and yellows with oranges thrown in for a "boy" quilt! Colors I can work with and yet the boy would not call "sissy" colors! I like primary colors for boys. For a boy quilt I would like to see several shades of turquoise with navy, khaki and a dark orange. Congratulations. I love the Topiary collection, very nice. I would like to see teals/tans/muted oranges & yellows for a boy. Lovely fabric, lovely block. For boys I think red is a good choice. Great block! For boys, I think it depends on the boy, I like blues, greens, and oranges. I think your block is very sophisticated and would be great for an adult or mature (college age?) teen. For a boy, I think specific colors depends on age, but always bright blue, red and or green, with maybe some gray or black in smaller pieces. I think you can make a boy quilt with any color as long as it is dark. Like not pink but red would work. Beautiful! For a boy, I like the colors of blue, green and brown. I love your topiary line. I think navy with lime would be a great color combo for a boy. I like shades of blue, darker gray, and a bit of brown thrown in. Take the color of tree bark, grass, snakes, sticks, stones, puppy dogs and dirt and you have a boys perfect quilt. So I guess we are looking at browns, greens, grays, and bark. How fun. Oh I forgot mud and puddles, little boys have to have mud and puddles. Thanks Ananda, once again, I love your new line. Cute block. I would like blues and greens for boys' quilts. Amanda, your fabrics are stunning, as usual and look forward to receiving your newsletters featuring beautiful quilts and projects for us to make. You are not age specific regarding colors I might use for a boy, so if he is a toddler, primary colors would be my choice, and if he is old enough to have formed favorite colors of his own, then I would definitely use those. For a boy I would like blue, orange, and gray. I like your block. The color for a boy is determined by the age group. Blue is a given. Baby pastels, toddler bright almost any thing, school age goes to school colors or favorite team colors. I like brights and blacks for a boy. I love your fabrics and would try to make the block. For a boy I would use nature colors: brown, green, blue and touches of yellow. well my little boy is quite keen on oranges and red and such. What a great Giveaway. The fat quarter bundle looks amazing! I like aqua (or teal) and brown for a boy. Thanks for sharing a copy of 100 Blocks. Snips and snails and puppy dog tails, that's what little boys are made of. Blues and reds and browns. My "little" boy is now 18 and there is no color in his life! lol. However, I'm thinking blues (shades of demin) and orange. Of course burnt orange is great since we're UT (University of Texas) fans! Your block is beautiful - so whimsical! My favorite colors for a "boy" quilt are different shades of blue mixed with a cream color. Thanks! Love your fabric. I am on a kick of turquoise, with burnt orange and grey for a boy at the moment. I have a new grandson and his nursery is deocrated in all shades of blues, turquoise, black and a touch of yellow. It is really pretty. Love the block! And the new Topiary fabric line! Teals and greys would be very cool for a boy's quilt in my opinion. Congrats and thanks! Beautiful fabric line no wonder you used it as your inspiration! I'd love to see more pastel shades of the primary colours that are often used in boys fabrics designs. I really love your block. My colors for a little boy right now happens to be very bright colors. I have been designing a minecraft quilt for him and the colors are bright. My other choice would be turquoise and browns. I love teal for boys - bright yet not too girly & goes with lots of other colors - lavender, tan, brown - even some greens. Great block & great giveaway! Love your new fabric line. Its very soothing. my favorite color for boys brown. Thanks for the opportunity. Amanda, the block is darling. Great job. Looks like fun to play with. for a boy, I'd like to use shades of navy, denim and bright yellow. Love your block. I think blues and yellows would make up a great quilt for a boy. Thanks for the opportunity. congrats, this is a very pretty block. and you are very clever to use the tree pattern from the fabric. When I make a baby boy quilt the main colors are blue and green. Then I throw in some primary colors to brighten it up and make it fun. Love your block and that topiary fabric! For boy colors, I am a big fan of the brown & blue that was popular a few years ago. To jazz it up a little, I would throw in some orange or yellow. Congrats on getting your block and quilt into the publication. Thank you for hosting the giveaway. Love that Topiary line of fabric! For boys I would say mid to dark levels of blue with some gray and orange. Thanks for the opportunity to win! Thanks for offering the giveaway Amanda. Cute topiary block. For baby boys I prefer to use green, blue & yellow pastels and for toddlers I like using bold primary colors. Hi!!! Love your block and the fabrics!!!! I had three boys and now one grand son 6 yrs old!!!! So for boys Yellow,blue,red,green and gray!!!! Green and Orange would be great in a boy quilt! Green and Blue. Nice block congrats and thanks for the chance to win. Love your fabric and would be thrilled to get some! As for boy i like primary colors. My son very much likes orange and often the brighter the better! Shame the quilt I just made him is predominantly aqua! I would like blue, gray and yellow/gold and a melon color. I love the Topiary line, Amanda. It has colors I adore in it! It would be a wonderful prize to win, plus the 100 Blocks is ALWAYS a best prize for me. For boys, I'd like to see color. Too many boys clothes are limited to blue and brown. Boys like color too! Green and yellow are wonderful additions to blue and brown. Thank you for the chance to win. Love the fabric!! Boys...teals, oranges, and browns. Love the topiary collection! I'm a mix of blues and slate gray for boys with some yellows...yummy. LOVE the Topiary colors for myself! For a boy, blues- cobalt and turquoise and greens-Christmas and lime with some warm browns and maybe a surprise touch of purple and gold. Congratulations and thanks. When my grandson was born (in July), I made him a red, white and blue quilt. He would tie it round his neck and run through the house yelling Captain Bulldog!!! His dad graduated from MS state. I would love to see blue and orange. Thanks for the chance to win. Lovely block. For boys I would choose some blue , green and orange. your block is so doggone cute! I really love the look and think it would look great as a pillow top, too! I would love to see some cars and trucks, or emergency vehicle fabric for little boys! Gorgeous fabrics!! Love the block also. A boy's quilt would be lovely with limes, blues, and orange.. So glad to hear that I am not the only one who does not have a green thumb. What a fun block! Let's see...for my grandboys: how about grey mudpuddle, various greens, and some pops of blues? For my grandson I did one in green and yellows and another in dark navy and red. Hmmm. Boy's quilt. Baby boy, toddler boy, teenager? for a baby, I don't think gender really influences the color choice. I'd use whatever the mother wants! For teenagers, I think it really depends on what they are into, so I'd choose novelty fabrics that feature things they like, and pick the other colors from the fabric. Toddler boys? I think primary colors work best for them. I had a boy who preferred brown and green and one who preferred black and red. I guess I would choose black and brown and one accent color in a quilt for a boy. Neutrals and a splash. Very pretty block. For boy quilts, I would say shades of blue or primary colors. For boys...maybe red, white (cream actually!) and navy blue. Such a darling block! Colors for a boy? Well - mine is clamoring for green/grey/white - maybe with accents of blue and orange? I really like to see blues and tans in a quilt for a baby boy. Another idea I really like to do if I know the family is interested in a certain sport... I love to make quilts in scarlet, grey, and white -- Yes, Go OHIO State! I love navy/green for a boy! I like bold colors for a boy's collection-prints are good but mixed in scale. Seems like" boy's fabric lines" are so stereotyped. Thanks for the giveaway. What a beautiful block and fabric. How proud you must be of your fabric and I love the colors. What colors for a boy's quilt...colors of the earth that they love to play in, black for the stones they love to throw, green for the trees they climb and blue for the water to splash. That would make a lovely quilt for a lad. I love your fabric and all your patterns! I like a dark green and browns for boys. My favorite for boys are blues and greens (not too dark) with splashes of yellow and purple. I'm very traditional so for a boy I would buy fabric that is blue, green, yellow, or red. I'd stay away from pinks or anything feminine. Congrats on being published in Vol. 9! Peaceful blues, turquoise and teal, with accents of complimentary colors would be great for a baby boy without being too over stimulating. I think it would be "scrumptious"! Thanks for the opportunity to win. For boys I like black, white and a little red, or greens and/or blues. Actually, anything but pink goes. Blues and tan i think are nice. A very young boy would really enjoy bright, clear primary colors. Fun to make for the quilter too. My youngest boy said he likes greens/purples/grays in his quilts. Great block! Thanks for doing this giveaway. I would use blues, greens, and reds in a boy quilt. Love the topiary collection. I would use blue, green, yellow and orange in the boy collection. Yellow/blue/brown are my favorite colors for a boy's quilt. Congratulations on being published! I think teal/brown/yellow or orange would be cute colors for a baby boy. Love your fabric, for boys I'd love a variety of blues, green and oranges. Love all your fabrics and patterns! Especially since you ar "NC girl"! 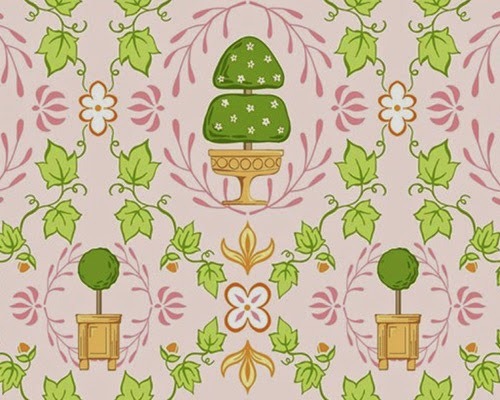 Gorgeous fabric to make a topiary. Love gardening and fabric. Boy colors, how does slate grey, light grey, a little black, sea foam green, blues and red. I like blue and brown for a boy! I love bright red, green and blue for boys. Super fabric. I love it. This is a fun blog tour, thanks for putting my name in the drawing. Fun block and fun blog. When I make a baby to young boys quilt I use blues, greens, tans. For an older male I would use blues and browns. Very nice block. Many a formal (and some not so formal) garden in the South include topiary. My favorite are the shaped bushes turned into animals and such. As to boy colors - I think anything except pink or pastels would work. I think primary colors are great for a quilt for a boy. thanks for the chance to win. Thanks for the chance to win. I would use primary colors and lots of shades of blue. 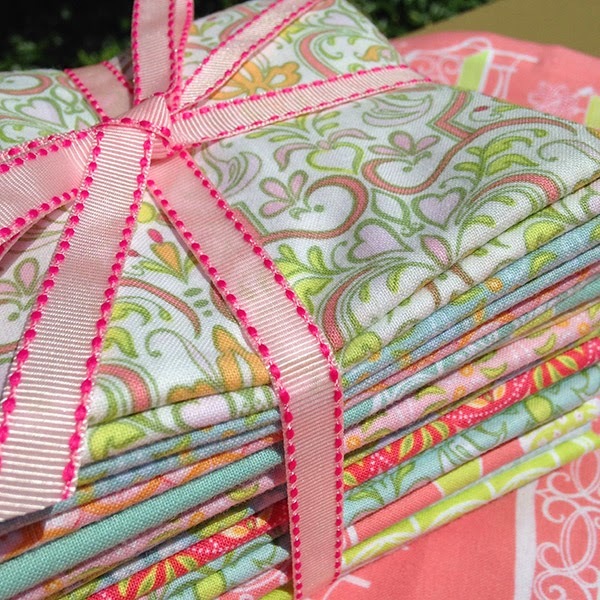 Very pretty block and fabrics! For a boy I tend to think of blues and greens, with some neutrals thrown in and maybe a touch of yellow or orange to give the eye a small break. I love red and blues with spots of yellow for a boy. For boys, yellows, greens, blues. I have been thinking about making a green and yellow quilt for a boy. Hey we are Farmers and DH bleeds John Deere Green and yellow. Boys like blue, green, and red! My grandson inherited a pink bike and he said only green and red would suit him! Blue and yellow for a baby boy, but my 5 year old grandson demands red. Hmmm....blues, tans and a smiggion of red. That's what boys are made of! Beautiful block, by the way!! Hi, I love your block, it's so pretty. for a boy I would go with blues, greens and whites. Congratulations! I love your Topiary block and fabric! For a young boy I like blue/green/orange....my favorite new color combo is navy/orange. Thank you for sharing! Let's see boy fabric colors....hmmm, I assume that since you said boys we are talking school agers here so I will go with nautical colors, navy, white, red, yellow. P.S. I am in serious love with your collection, it's gorgeous. What a wonderful block. I love the fabrics, they are wonderful. Wow colors for a boy. If it is a baby boy I would choose blue and green. If it was a toddler I think I would choose blue and yellow. Congrats on being chosen for a block in the magazine. Cute block. For a little boy I might choose light green and gray. For a boy I like orange with blue or green right now. Teal blue, orange & green. Very pretty block. For a boy I like to use blues and greys. I think shades of browns, teals & a punch of yellow & green would be great for a boys line! Really cute idea for your block....I like it lots! For boys I would like to see something without blue, maybe greens, browns cream and red. Thanks for the give away! I have an 11 month old grandson and I would love to see more purple for boys, girls have had a stranglehold on lavender forever! Love your block and fabric line. Congratulations on your block being selected. For a boy's quilt fabric, I'd love to see some bright green. Thanks for the great giveaway. I like blue and green in a boy's quilt. The design in the fabric also determines if it's for a boy or girl. I like geometric shapes for boys. Love you fabric and your block. My favorite colors for a boys quilt depends on the age of the boy and the fabric to be used. It the quilt is a nautical theme then shades of blue. If the quilt is western in theme then browns and greens. Congratulations on having your block chosen for Issue No. 9. 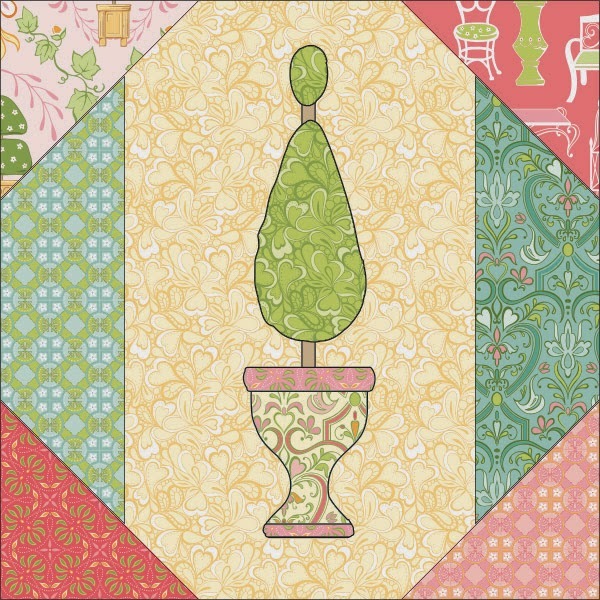 Making your block with your Topiary line of fabric is very fitting! My son loves greys, blues, and blacks. I would like to see a boy's quilt made with aqua, lime green, and white! For boys I love using Lime, Royal Blue, White and accents of orange tones. I tend to stick with browns, blues, and whites, off whites for boys quilts. Sometimes I'll use the red, blue, yellow and green as well. Your block is sweet. Thanks for the chance at the giveaway! I like brights if they are young, and if not, any other browns, blues, tans. I also use batiks with off whites or tans. Your block is very nice and I appreciate the opportunity to win. For a boy I love blue and green. Thanks for the chance! I like yellow, teal, and grey for a guy quilt. Love Navy Blue and Green together for a boy. I've made a pair in this combination for 2 boys of triplets and they looked great! Cute block! For boys quilts I like mostly primary colors or blues and greens. 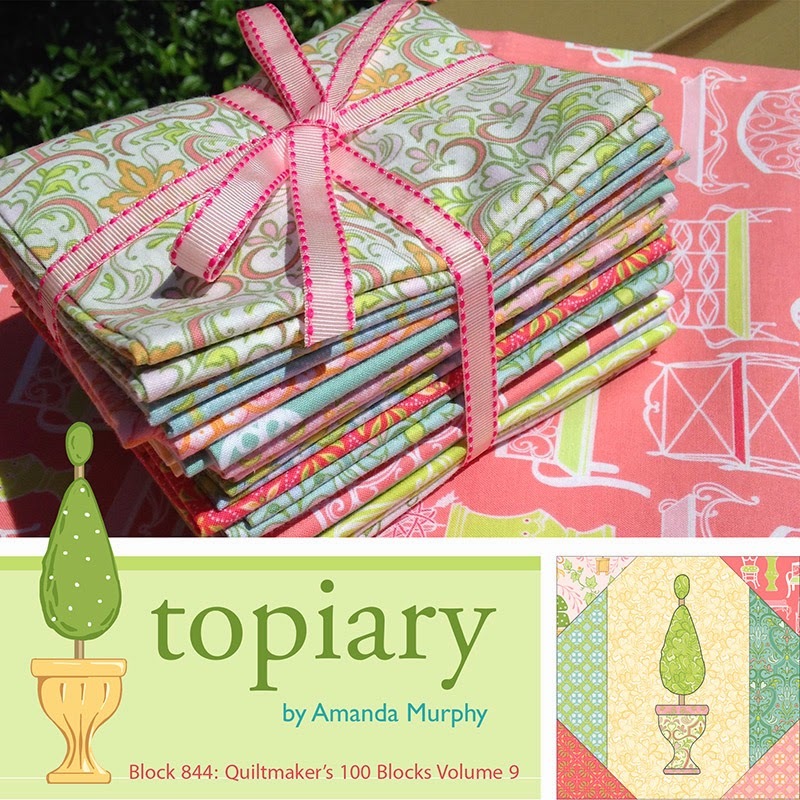 Love the block and the topiary fabric line. I like blues, browns and greens for a boy quilt. Thanks for the chance to win. Cute block and even cuter fabrics! I like green in boys quilts~ everyone associates boys and blue, but think of the grass stains too. LOL Thanks for the chance! Beautiful block and gorgeous fabric!! For a boy, I like colors from the original crayon box - red, blue, green, yellow, orange, purple! All nice a bright! What a pretty block. Colors for a boy's quilt ... blues and greens ... red, white and blue ... black, orange and white ... grey, black and red. Blue and Brown which are the colors I used for my 28 year old son a quilt, and he loved it! I love turquoise for a boy, you can blend brown or black and keep it masculine but a bit nontraditional. Love your topiary!! Love the fabrics in this block...sooooothing. Blue and orange would be fun for a boy. Love your block! I love blues and grays with a little red. Blue and orange are catching my eye for boy quilts right now.